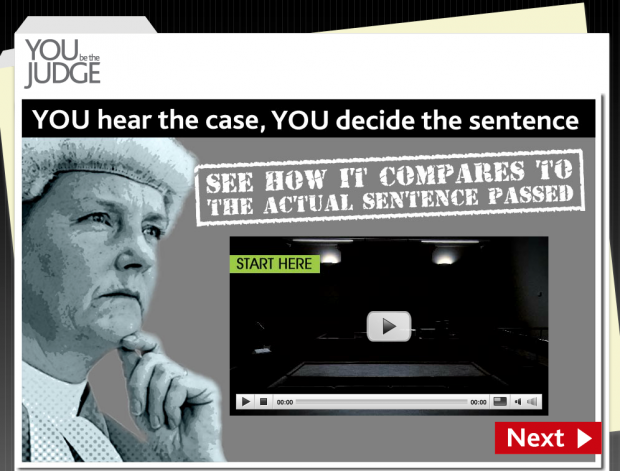 You be the Judge is an interactive tool that helps people learn more about sentencing, by putting them in the judge’s seat. Research shows that the public don’t understand sentencing, but that more than three quarters think sentences are ‘too lenient’. Changing people’s attitudes is notoriously difficult, and measuring the impact of initiatives to do so can be just as hard. However, we know that people change their minds about sentencing when they know the facts. You Be The Judge takes them through the facts of a case with a series of videos. They hear the defendant’s plea, and any aggravating or mitigating factors, before deciding on what sentence to pass. They then compare their sentence with the one handed out by a real judge. For example, one of the cases is about a man who has been found guilty of stealing a young woman’s handbag at knife point. The user is taken through the court case and asked to choose between sentencing options like giving him a fine or detaining him in custody. After launching the tool, we wanted to work out if it had changed users’ views about sentencing. We couldn’t survey thousands of users, and couldn’t measure shifts in attitude with web metrics alone. Engagement metrics such as the time spent on the site, page views per visit or bounce rates gave us an indication. And user comments and Tweets gave us some insight into what people really think. But we were left having to join the dots and interpret the data. What do you think about sentencing? ‘Too lenient’, ‘about right’ or ‘too harsh’? The data is captured in a MySQL database which allows us to calculate the shift. Simple and unobtrusive. We were stunned by the results. For every three users who enter the site thinking sentencing’s too lenient, two leave it thinking it’s about right: we are succeeding in building confidence among 66% of our core audience. We don’t know if this will have a wider effect on attitudes, and we need to do more to promote the tool. But this is a great start, and shows the tool works. We’d love to hear from other people about how they’ve measured shifts in attitudes so please get in touch! We presented the tool at the Sprint13 conference yesterday, and people gave us some great ideas, including syndicating the content to 3rd party sites to improve its reach and allow people to reuse it. All other ideas are welcome. Just a small point but when I visited the site I had no real opinion of whether sentencing was harsh, lenient or correct. So I couldn't continue through that initial question without skewing your data. In the end I hit back, then clicked the link again and it skipped the question all together. Might want to include a "No real opinion on sentencing" option to allow people who don't have much experience with the legal system to continue and learn without skewing your data. Might be worth factoring in when we do future work on the tool. The youth court case entirely omits the sentence option of a referral order, when there is a guilty plea. Why? Sorry that isn't helpful at all. Shouldn't the presentation reflect the current actual position? It would not have been a state secret at the time of publication, after all. You be the Judge is not intended to comprehensively cover all of the sentencing options available to courts, but rather to be a simplified scenario that gives a flavour of how sentencing decisions are made and the factors that courts take into account when sentencing. Referral orders are a fundamental component of the youth justice system and they were considered for inclusion in the scenario. However, the tool was commissioned before Royal Assent was received for the Legal Aid, Sentencing and Punishment of Offenders Act 2012 and it was considered inappropriate to include a sentencing option that had not yet received Parliamentary approval. Thanks again for your feedback - we will again consider including referral orders when we update the tool.